If internet is the driving force for modern innovation, smartphones could sure be called its current vehicle. Introduced as portable devices to make calls, smartphones today deliver much more than this basic functionality, far beyond anyone's imagination. But this rapid innovation is not just restricted to regular users. The mobility of smartphones has disrupted how companies use technology. Mobile CRM is just the latest of these trends. If you are in sales, the game has pretty much changed for you completely in the past few years. Today, sales representatives are required to know every relevant detail about the customer they are dealing with. Even if the customer doesn't expect you to know it, it is still your job nevertheless. Processing the necessary details about your customers is one of the basic steps in giving them a better user experience. With mobile CRM, this can be done anywhere. You don't have to be in your office for accessing this information. It is available on your fingertips whenever you need it. 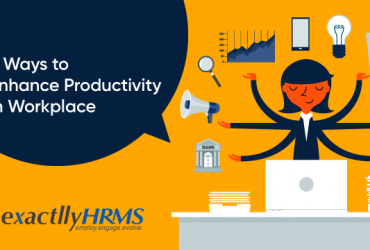 Thus, it naturally boosts productivity and makes things simpler for the sales reps. Furthermore, mobile CRM makes it easier to log information. 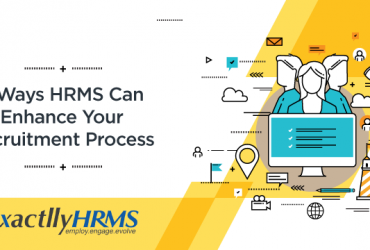 Instead of the usual two-step process (conversing with the client and logging the information in CRM), this can be done simultaneously on mobile CRM. A typical sales cycle in any business consists of 7-8 stages. From finding new prospects to closing deals and beyond, there is a lot of work involved. Since the sales one makes is directly linked to his/her earning, there is generally no shortcut around it. This changed with mobile CRM. Put simply, mobile CRM effectively shortens the sales cycle. Like we discussed above, crucial information like customer purchase history, product availability, pricing etc. is available to the sales rep anytime. With access to this goldmine of information, you need only a few interactions to finally close the deal. Thus, you are able to spend more time in finding other prospects, which directly impacts your earnings. But how does that affect the customer experience? Well, customers are some of the least patient beings in the world. Having an appointment, making a pitch, clarifying the doubts – there are a lot of steps involved. Every step increases the chances of the customer of getting bored/agitated and declining the offer. With mobile CRM, the number of steps is shortened and reduced, thus customers are more likely to remain engaged throughout the sales cycle. It’s a win-win for everybody. Sales is a profession like any other, but you won’t get around by simply being professional. The best sales pitch always makes it personal. All of this is done to build customer loyalty. Anyone in the sales business would know that customer loyalty is more fragile than fresh snowflakes of winter. It takes one bad decision for customers to switch loyalties and switch to a different brand. Things are tough, but mobile CRM can make it simpler for you. In simple words, mobile CRM allows you to be there for your customers. No longer will the excuse “I was not in the office” cause customers to leave your brand. With the mobility of this version of CRM, it is possible to stay in touch with your customers anytime, anywhere. More reliable vendors also equip the software with alerts and notifications on your smartphone, along with access to complete customer/product information. Customers are not the keenest people to acknowledge the efforts of the sales reps, but they sure notice it. Being there for the customers will help to build a more personalized experience for them, not to forget, it will strengthen the brand loyalty, which will only help to improve your sales. Few things in the world are infinite and the catalog of an e-commerce website is one of them. Atleast this is what the customer feels. Most customers do log in to a website to buy a specific product, but the plethora of options is enough to disorient them. The filters can only help to an extent. More choices have always been considered a good sales practice, but it is not so great when it starts confusing the customers to the point of losing them. 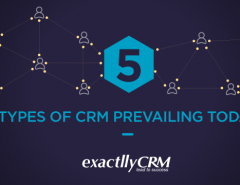 CRM emerges as a solution to this problem, and mobile CRM is an even better one. As you might be aware, CRM comes with the capability to perform analytics on customer data and provide insights. These insights often include speculation about what the customer needs currently or in the near future. Together with the vast array of information about inventory, you are able to give customers exactly what they need. Mobile CRM extends this capability to your mobile devices, regardless of the time and location. All the insights are available to you 24×7, so not being in office is no longer an obstacle in building lasting relationships with customers. Additionally, customers usually want to be the ones to decide how the communication goes with you. With mobile CRM, you are able to do just that. Whatever time the customer decides for correspondence, you can always be there for them. A recent study revealed that 62 percent of the companies never reply to customer support emails. Furthermore, the average response time is well above 12 hours. A decade earlier, when e-commerce was only beginning, this might have been acceptable. Today, not at all! No response or delayed response to customer queries is just a non-verbal trigger for them to leave your company. You need to provide constant and quick support to address their concerns or queries. Fortunately, mobile CRM is here for the rescue. Again, access to vast information comes into play here. 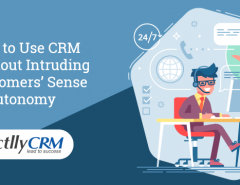 Essentially, you know everything about the customer as well as the inventory, thanks to the central CRM storage that logs every bit of information. With mobile CRM, all of this data is accessible at your fingertips. Thus, you are able to solve customer queries on the go, without worrying about working hours or being in the office. 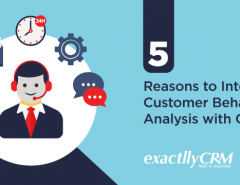 Good and efficient customer support forms the foundation of a good customer experience. Mobile CRM is the natural future of CRM, just like CRM was the future of customer management. The sheer benefit it provides is incentive enough to jump on this train and be part of an innovative future.